Rhea Lana's, Inc. is an upscale children's consignment event business that has its humble beginnings in Arkansas. We now hold semi annual events in 23 states across the country! We are proud to serve moms from Hawaii to Florida and many states in between! Shoppers come from all over to purchase excellent quality children's merchandise at affordable prices. We now have hundreds of consignors and thousands of shoppers. Our most popular brands are Gymboree, Hollister, American Eagle, Gap, Baby Lulu, Polo, Tommy Hilfiger, Nike, Roxy, Cinnamon Girl and Hurley. Our most popular toys are Little Tikes outdoor playgrounds, Racing Car beds, Kitchens, Doll Houses, Tool Benches, Barbie Jeeps, Brio wooden train sets, and American Girl Dolls and accessories. We also carry beautiful nursery furniture and bedding, cradles, carseats, strollers, high chairs, exer-saucers and walkers. Thanks to our Consignors who generously donate their unsold items to Rhea Lana's who then make contributions to local organizations that reach out to those in need in our community. 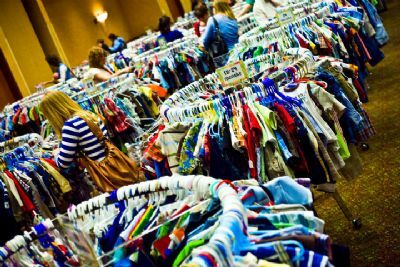 We receive HIGH QUALITY children's clothing on consignment and sell at our event. We give consignors a generous 65% of the sale price (which they select). We GUARANTEE no lost items. Consignor's checks and reports are available on Pick up Day after the sale. You don't have to wait for it to arrive in the mail! No. At our events we carry children's furniture, nursery bedding, maternity clothing and nursing accessories and infant equipment (such as strollers, high chairs, car seats and portable cribs.) We also carry high quality toys, children's books, video games and sports accessories. We have "The Furniture Nook" available for those Consignors who are finding new homes for their high quality gently used furniture. The most popular items we are looking for are gently used leather sofas, Shabby Chic furniture and other updated furniture styles. We are excited for this opportunity to continue our efforts to help meet the needs of your family! Most consignment stores give 40-50%. Why do you give 65-75%? Because everybody else is doing it (kidding). Actually, we have had our website online for approximately 10 years. When we developed our unique barcoding system and online data entry system, many moms did not yet have computers in their home. If they did, they were just beginning to learn to email and use the internet! But moms have learned to love entering their items online and tracking their sales throughout our events! Rhea Lana's gives them control in pricing their items and makes it very easy to make a great profit. As you can see, consignors can be very involved if they wish.